what is next stop on spx? 900 or 700? Multiple choice poll. Total votes: 6 Please log in or sign up to vote. Your 4, my C - close to ending per the hourly chart shown below that I marked up on Monday. What will differentiate between the two will be the upcoming pattern retracement. so you are expecting a move up to (Y)? i have a small rst that says one more higher high possible in short term, and still have larger ED on my chart in tact. if we were to go to one more high, and hit your (Y), what is the larger count at that level? is the the end of an A up of intermediate 4? or is that where my 4 would be? ...what is the larger count at that level? It would complete wave C of a larger 4th triangle of intermediate degree. And yes, the hourly count idea would suggest one more higher high (probably into opex), and then, initially, a full retracement to the 780 cash level - bounce - and then we'll re-examine the situation. The 875 level remains the key to both counts with a move above this level suggesting that something else is going on. what retracement would invalidate your triangle and put the ending diagonal into focus? what price on the spx would do that? not sure what the correct question to ask is. if your count is the end of intermediate 4 then you would be forecasting new lows on intermediate 5 correct? more importantly, how would you distingiush whether we are completing minor 4 and heading to minor 5 of intermediate 3 vs. your idea that we are finishing intermediate 4 going to intermediate 5? what retracement would invalidate your triangle and put the ending diagonal into focus? Moving below .618 times the length of Wave C in Wave D would then call the triangle into question (for those out there who don't know, an Elliott Triangle has 5 "waves" to it: A-B-C-D-E). what price on the spx would do that? We won't know that until we know that wave C is complete. if your count is the end of intermediate 4 then you would be forecasting new lows on intermediate 5 correct? Yes, after wave D down and wave E up to complete the 4th wave structure. how would you distinguish whether we are completing minor 4 and heading to minor 5 of intermediate 3 vs. your idea that we are finishing intermediate 4 going to intermediate 5? What it really comes down to is what one would believe to be a "reasonable expectation" when it comes to both time/price and fundamental/sentiment characteristics that make each price pattern (wave) structure. But to answer your question directly, it could be that of minor degree if the bigger picture is one of Supercycle degree or greater, but realistically, it's probably better to count the whole structure as that of intermediate as it would "fit better" given the current circumstances, and keep such higher degree considerations on the back burner...at least for now. Looks like wave 4 of [Y] is now done...updated count with a Hist MACD momentum study backdrop. OK...we now have minimal price expectations met, and bear divergence across the board (daily and all lesser time frames) using the Hist MACD as a guide. 875 cash remains the line in the sand for any further "throw over", so let's call wave "C" of the daily triangle now complete at 870 (or nearly so), with a wave "D" giving us a downside Fibonacci target of 750 cash. Taking the daily count idea one step further, I have now adjusted the support and resistance lines for the triangle based on the basic Fibonacci sequence of .618 retracements, and then outlined the preferred path (in gray) in which price "should take" to complete Intermediate Wave (4). 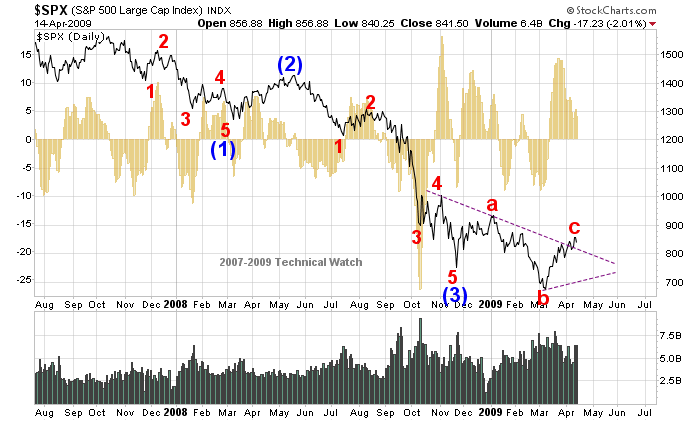 Any break below the 750 cash level by 3% or more would put Gelf's count idea front and center and worthy of salute! The completed corrective Elliott Wave structure is shown below, with the rising wedge pattern, as well as the Hist MACD, both suggesting that the 780 cash level should be challenged during this retracement period. If, however, the Hist MACD is able to break to lower lows than those seen at the end of March, then the next price target will be the .618 forecasted target of 750.
hi dave, still looking like both of our roadmaps are still in process. i have to say i am more in the camp of your triangle idea than my ending diagonal idea. what are your thoughts from here now that we have broken the smaller upward sloping ending diagonal. what would you expect from here based on your roadmap. what would alter the picture to make my ending diagonal the main focus? what are your thoughts from here now that we have broken the smaller upward sloping ending diagonal. what would you expect from here based on your road map. Technically speaking, Monday's sell off moved many of the MCO's to their zero lines which would suggest some sort of bounce on Tuesday (which we got). This bounce would then be part of a larger price pattern snapback to or towards the ascending wedge (in process), falter, and then a resumption lower to the intended 780 target. what would alter the picture to make my ending diagonal the main focus? Since both of our wave structures would be that of 3 wave affairs, the demarcation point between the two would come at the 750 cash level, + or - 3%. but it becomes quite appealing to do so. The month long congestion area on the SDS weekly, between 55 and 63, intrigues me. Curious as to "how" it could be counted. Thanks in advance Dave! any chance you can do an updated Elliott count for the SPX and the Dow Trannies? I'll try my best to get around to it sometime this weekend. A lot sure has changed since your last post of Elliott count - any update possible now that most are calling this "a new bull market"? It's getting very crowded on the 'bull' side and seems like a US dollar rally is brewing as well - both signs of some 'real' weakness for equities ahead! Thanking you in advance for your thoughts. I'll try to find some time this weekend to review it...haven't looked in a while so it will be with a fresh eye.